The European project BEACONING, which has INESC TEC’s participation through the Centre for Information Systems and Computer Graphics (CSIG), was present on 20 and 21 November at the European Parliament, Brussels. BEACONING was selected among hundreds of research and innovation projects under the funding programme HORIZON 2020, regarded as a reference in the category “tech with a societal aspect” together with ten more projects. With the organisation of this session, the European Parliament intends to show the importance that the multidisciplinary research has in order to address societal challenges. Serious games play an increasingly important role in areas such as education and training, heath care and ageing, inclusion, citizenship, innovation and digital transformation. 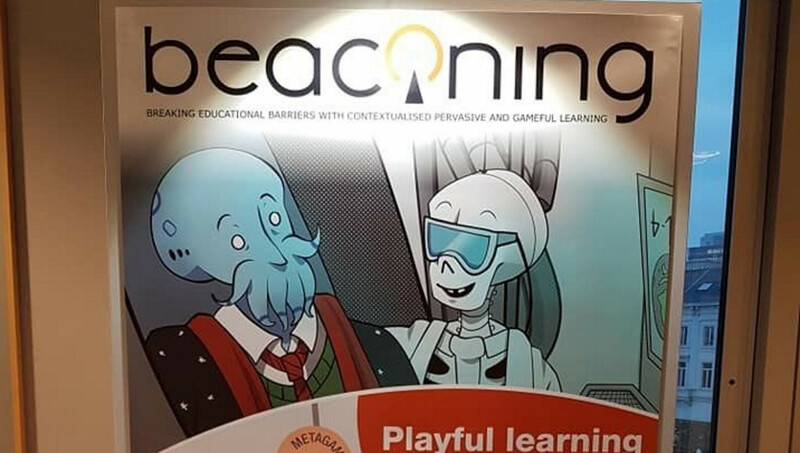 BEACONING, which had a funding of € 5,9 million from the European Commission, focuses its research on the integration of technologies, pedagogic and social perspectives in order to develop and to validate a complete platform that incorporates gamification techniques, mobility, content creation, game authorship, learning analysis, among others. The developed platform is adaptable, extensible and sustainable, allowing to explore and to measure the efficiency level and impact of the games in students. Currently, the technologies are being validated in large-scale pilots in different European countries such as Greece, Turkey, France, Israel and Romania. The BEACONING project started in January of 2016 and will last for three years. In total, fifteen organisation from nine European countries are participating in this project, which is funded by the European research programme Horizon 2020. This project, which is coordinated by the Coventry University (United Kingdom), had the participation of INESC TEC (Portugal), Herriot-Watt University and Hands Free Computing (United Kingdom), Playsoft, Succubus and ORT (France), BIBA Institute (Germany), Imaginary (Italy), Ifinity (Poland), Siveco and ATS (Romania), the Complutense University of Madrid and Geomotion (Spain) and Sebit (Turkey).